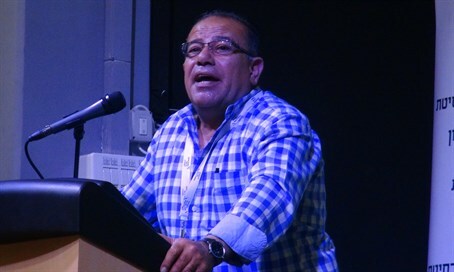 Palestinian human rights activist Bassem Ayyad, a former investigator for the radical leftist NGO B'Tselem, surprised a conference of Judea and Samaria researchers at Ariel University on Thursday when he revealed unofficial Palestinian views. Arutz Sheva got the chance to speak with Ayyad about how Palestinian Arabs view the Palestinian Authority (PA), and learned he thinks most would in fact love to see Israel annex Judea and Samaria. Ayyad explained that "the Palestinians have become frustrated by the attitude and the behavior of the Palestinian Authority." He noted that since the PA was created in the 1994 Oslo Accords, Arabs living under the organization only hear about corruption from it, and he emphasized that the PA hasn't built a single kindergarten in Judea, Samaria or Gaza in its entire existence. If you were to secretly poll Palestinians, Ayyad asserted that "99.9% would ask to be under the Israeli authority rather than under the Palestinian Authority." According to Ayyad, Palestinian Arabs living under the PA want something different, and they "would love to see themselves tomorrow annexed to Israel." Arab citizens of Israel could have served as a bridge between Israelis and Palestinians, he said, but instead they incite against Israel and show "hatred," and therefore instead of bridging between the two sides they in fact do the opposite. Turning his attention to human rights organizations, the activist said that most have a political agenda rather than a human rights agenda, and noted that he felt the politicization in the radical B'Tselem. Ayyad argued that the core of the problem lies with the funders, with many in Europe who fund groups like B'Tselem seeking to promote anti-Semitism. In his speech at the Ariel University conference, Ayyad made clear he does not blame Israel for an "occupation," but rather for forming the PA. He said the true "Nakba" ("catastrophe" in Arabic) for Palestinians was the founding of the PA in 1994 - the term Nakba is used by Palestinians to describe the inability of Arab armies to destroy the nascent Jewish state in 1948. "If you ask a Palestinian today 'what Nakba do you suffer from more, 1948 or 1967?,' he would tell you the true Nakba is the coming of the Palestinian Authority in 1994," said Ayyad. "There is great suffering today under the PA. This is another Arab dictatorship of Israeli invention." "Israel is very interested in rehabilitating Gaza, but the PA is very interested in the destruction of the Gaza Strip. That's how things are. From 1994 and until today the Palestinians are starting to understand that their lives under the Israeli government will be a lot better than under any other government." The conference was organized by the Regavim movement and the Adam and Adama Center.